Work Plugs, Rings and Set Plugs Vermont Gage's thread gages inspect the pitch diameter & the functional thread for both internal & external threaded products. All stocked thread gages are made to Class X tolerances per ANSI B1.2(Unified inch screw threads) and ANSI B1.16M(Metric M series screw threads). All thread gages are supplied with a Certificate of Accuracy. Work plugs are stocked in 2B & 3B(inch) or 6H(metric) classes of fit. 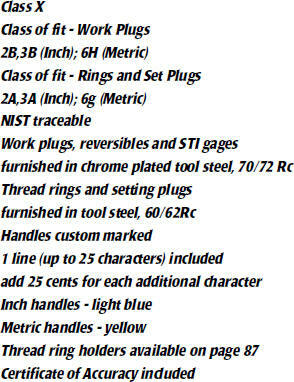 Rings and setting plugs are stocked in 2A &3A(inch) or 6g(metric) classes of fit. Stocked work plugs are chrome plated. All thread gages are marked with nominal size, threads per inch (inch) or pitch (metric), class of fit and pitch diameters. One line of additional marking (up to 25 characters) may be included at no additional cost.